On 16th June 2000, during Tom's 9-month kidnap ordeal in the Colombian jungle, Tom opened his diary and began plans for a garden which would contain plants from around the globe planted in their respective continents of origin. This plan would eventually become ‘The World Garden of Plants’. Tom Hart Dyke is a modern day plant hunter who follows in the traditions of the plant hunters of old who risked life and limb in pursuit of fantastic blooms and plants. Tom’s World Garden pays homage to the amazing achievements of Victorian and Edwardian plant hunters who brought back the plants and flowers we now cherish and grow in our gardens in the UK. Established in 2005, the World Garden of Plants continues to grow and build year on year, adding rare and important botanical plants to its collection. An example of the Dinosaur Tree (Wollemi Pine), the oldest tree in the world, is planted close to Ayers Rock (Uluru) in the Australian border. The world's rarest Gum Tree, Eucalyptus morrisbyi, a graceful species that Tom collected in South East Tasmania in 1999, flowered for the first time at Lullingstone in 2009. Penstemon ‘Crac’s Delight’, discovered by Tom in 1999 and named after his Granny, now blooms in Mexico. 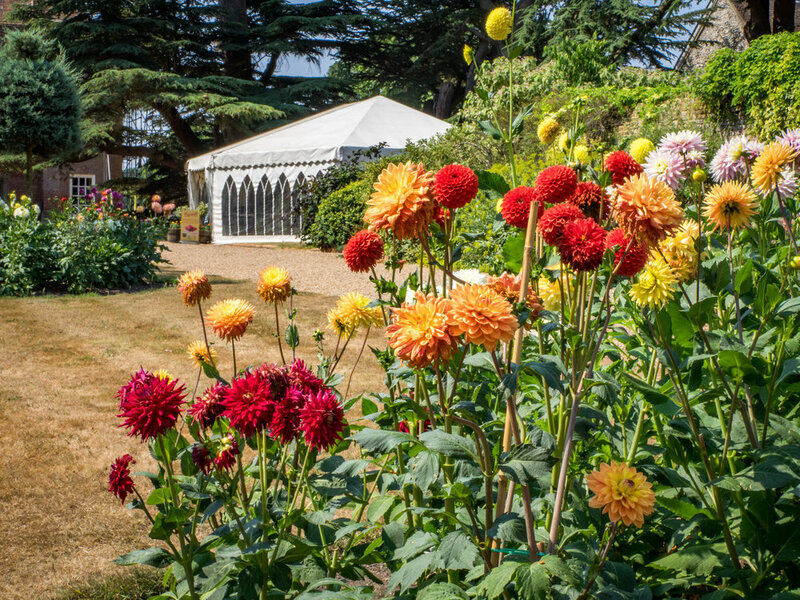 Awaiting official recognition, the Dahlia 'Lullingstone Castle', a big pink-petaled, yellow-centred single flower, was discovered in the World Garden in 2009. There are innumerable other horticultural delights for visitors to see, smell and touch, including the stinky Dog Pooh plant (Hoodia gordonii) the world's most dangerous plant, the Queensland Stinger (Dendrocnide moroides) and the hottest chilli - Dorset naga. Or very own World Garden bees, Europa riding Zeus, a baobab tree made from 51km of wire, totem poles blessed by our very own Native American Reg, Colin the Cobra hiding in South Asia, a fully functioning weather station, a dazzling Pineapple sculpture, Ayers Rock (Uluru) that Tom posed on for a local version of Calendar Girls, and much more. Tom Hart Dyke's Mum Sarah is the driving force behind the House; she is truly inspirational. Tom's Dad Guy was the Estate Manager, although he sadly passed away on the 12th February 2018. Tom's late Granny is his horticultural inspiration and Tom's sister Anya built the new website! Alan Chapman takes care of the woodwork, while his wife Iris designs and gardens. Both also project-managed our 2011 Hampton Court Palace Silver Gilt Medal entry, the Moroccan Blue Room, Dad’s Log Store and Insect Inn. Andrea tries to help out at Lullingstone one day a week, with each visit offering something different. She loves the wildlife whether it’s the robin that follows her whilst she weeds or the mole hills on the lawn! Jim Buttress, holder of the RHS Victoria medal of honour, is literally a foundation stone in the development of the World Garden, working alongside Tom since 2005. Jo is an all round helper in the Garden and is always accompanied by her lovely dog. Laurence is one of Tom's oldest friends, a tree surgeon extraordinaire, responsible for the dead wooding in the historic cedar trees. Marcus helps out on the back gate directing all the cars so we don't get choc-a-block on busy days. Paula finds it a privilege to work with rare and unusual plants and is always learning something new from the other members of the team and from Tom's encyclopaedic knowledge of all things horticultural. Steve maintains all the grass areas in the grounds and finds that working in such a beautiful environment, surrounded by wildlife, gives him great pleasure.